Lots of adjectives get thrown about regarding the Sebastian Vettel/Red Bull combination's repeated demolition of opponents in contemporary F1. 'Dominant', 'devastating' and 'formidable' are among the most common. But in the direct assessment of today's particular demolition, which seemed just about the most decisive of any of them, 'unsurprising' seemed the most apt. Somehow, getting on for four years of dominance later (and five if you negate the odd double diffuser business of 2009), none of their haughty opponents seem any closer to working out how to stop them. And today they seemed further away then ever; Seb simply was on another level. From the point that his RB9 first turned a wheel in Friday practice the efforts of the rest for the Singapore Grand Prix of 2013 looked an exercise in futility. And so it proved, as Seb triumphed under the Singapore lights pretty much unchallenged. The only threat of the day to Seb's supremacy was confined to the first three corners. For the briefest of brief moments it looked as if Nico Rosberg, who'd qualified alongside Seb on the front row, would get ahead and thus at least threaten to tamper with the demonstration run. But while he indeed dived past at the first turn he was a bit too hot and ran wide, which allowed Seb to smartly nip back past. Though given what came next you rather suspect that even if Nico had maintained the place it would have caused but the most minor ripple in Seb's upward trajectory. Once ahead Seb performed his party piece: being bang on the pace from the word go, almost like somebody flicked a switch, and thus having the race utterly at his mercy before anyone knew it. He scampered off, stretching his lead by 1.6 seconds in sectors two and three of lap 1, then by a whole additional 2.2 seconds around lap 2. This was a rout. Behind Seb the other race, that over second place, for a long way threatened to be tepid too, as everyone ran in order. But it was given a major shake by a mid-race safety car - brought about by Daniel Ricciardo pranging a wall - which given its delicate timing split strategies broadly into two directions: either swap the tyres and seek to go to the end on that single set, or else if that's too tight stay out and pit later, probably under green. And as is usually the case in such scenarios, the two groups converged upon each other as the finish neared in an exciting fashion. 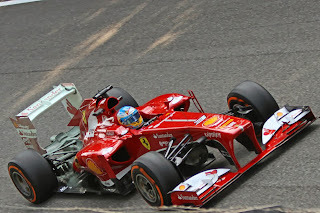 Fernando Alonso, as we know, is good enough to take the fight to Seb (and he pulled off the latest of his stunning first corner lunges today to be third from the off, that are becoming so regular that we almost begin to take the miracle for granted) but sadly his Ferrari most of the time isn't. But the Scuderia did get something right today to supplement Alonso's as-usual mighty race day effort, as the team pulled off the masterstroke that Alonso wouldn't pit again after switching tyres at the safety car period, helped by the characteristic of the F138, that we thought had been rendered obsolete by the mid-year tyre switches, that it's relatively gentle on the tyres. Red Bull and Mercedes didn't try the same, apparently in the latter case on the grounds that they knew it would never work for them. McLaren tried it with both cars but 'fell off the cliff' disastrously before the end. 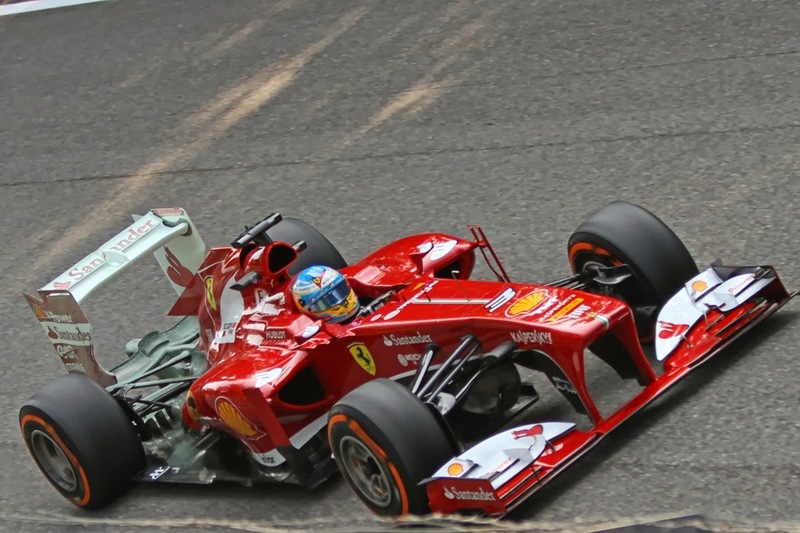 With Alonso it was close - apparently the team's calculations had the car falling from the same cliff themselves with three laps to go - but it worked, and Alonso thus was leapfrogged up to finish second in a weekend wherein the red cars were struggling. Kimi Raikkonen - bad back or no - did similar and also benefited from the E21's freakishly gentle touch on the Pirellis, and completed the podium. There then followed the two Mercs who as mentioned had to pit under green and therefore found themselves with plenty of time to make up and overtaking to do. As it was, they couldn't even get near Kimi before the end let alone Alonso. 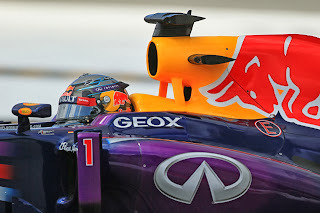 Fourth and fifth places in a race wherein they looked best of the rest behind Seb will be disappointing. Mark Webber led the charge of those who were left with the task of climbing the field late on, and may have got close to Kimi but for a late mechanical failure, first slowing and eventually stopping him. Felipe Massa was next up in P6, followed home by the now gripless McLarens. 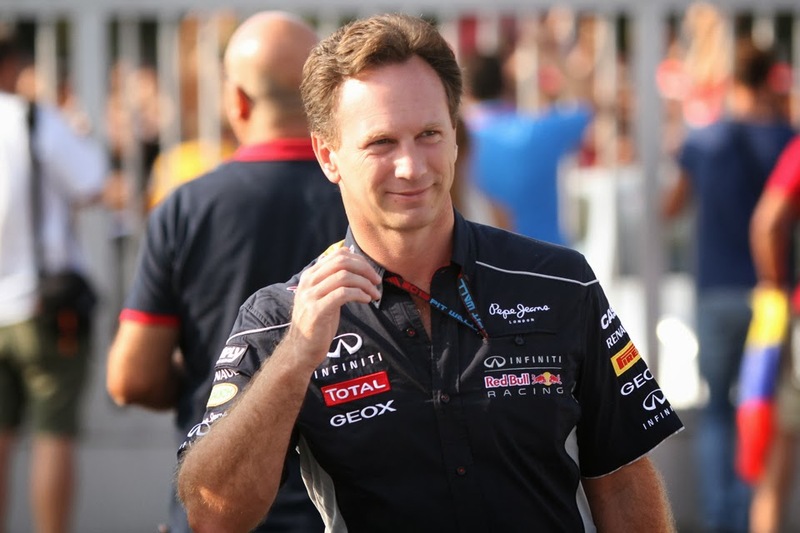 Christian Horner's Red Bull team? But if anyone thought the safety car (during which he did not pit) would disrupt Vettel's progress they were rapidly dissuaded on the notion, as he showed the pace that really laid under his right foot. Just two laps after the safety car went in Seb was 5.5 seconds up the road, and then he lapped routinely two seconds or more per lap faster than the best of the rest. After a mere fourteen times around after the safety car had bunched everyone he had comfortably more than the 30 second pit stop loss time required to change tyres and maintain his lead. In more ways than one Seb's show today seemed, dare I say, Schumi-esque. And, at the broadest level, surely Seb today effectively clinched drivers' crown number four too. There are many malcontents at the extent of the Vettel-Red Bull dominance right now. And, in seeking to unravel it all, part of our scrutiny needs to be directed at the likes of Ferrari, McLaren and Mercedes, as to how with their unending resources and considerable heritage in half a decade haven't answered any of the questions put to them, how they haven't got any closer despite having much time in which to do so. But part of our resolution too needs to be respectful of what exactly Sebastian Vettel and Red Bull are doing, that somehow they've discarded all F1 orthodoxy, built from the wreckage of the abortive Ford F1 effort as mere midfield fodder, and swept the board. And, most impressive of all, kept sweeping it. Despite having won everything there it to win repeatedly so far as we can sense not the merest hint of complacency has crept in. We had just the latest galling demonstration of it today. A fair summing-up (I would expect no less). they haven't caught up, none of them have the key ingredient, do they? first few races of the year (how long ago does Barcelona feel?). and he's clearly in the mix of the best drivers in the world right now. peer), he's gained too much success too easily at too young an age. always such a fighter just canter off into the distance every fortnight. the drama drains away and we're left with a rather clinical exercise. money is, so it would be an understandable instinct. Thanks very much Rick for sharing your thoughts. I know that Adrian Newey is a genius but I've always been a little sceptical of the idea that Red Bull's success is *all* down to Newey. If nothing else, it strikes me as a bit of an easy out for the other teams. And given they've had five years of rule stability in which to learn what Red Bull's doing it astonishes me that after all that time they look no nearer, especially given some of them have massive resources etc. As for Vettel, yes I agree that a lot of the hostility can be explained by the perception that he's had things a bit easy in his F1 success so far. I'd imagine that when the day comes that he has to overcome sub-par machinery his talent will be more obvious to people, just as it was with Schumacher in 1996 and Senna in 1993. I say this as I do believe that Vettel's a great driver. Its all about the new tire construction and thats all im going to say. It seems pretty clear that the new tyre construction has helped Red Bull (which was a lot of the reason why they argued for the change), but to say it's 'all about' that is a bit over the top. Don't forget that at the point of the tyre changes after Silverstone Vettel and Red Bull still led their respective championships and comfortably.